Bricks were made in Market Lavington for at least 200 years and were made up until the Second World War. In the twentieth century, the ownership of the brickworks had passed to the Holloway family at West Lavington. What we have here is a bill for bricks, purchased by one of the Holloway brothers. It is dated February 1924. 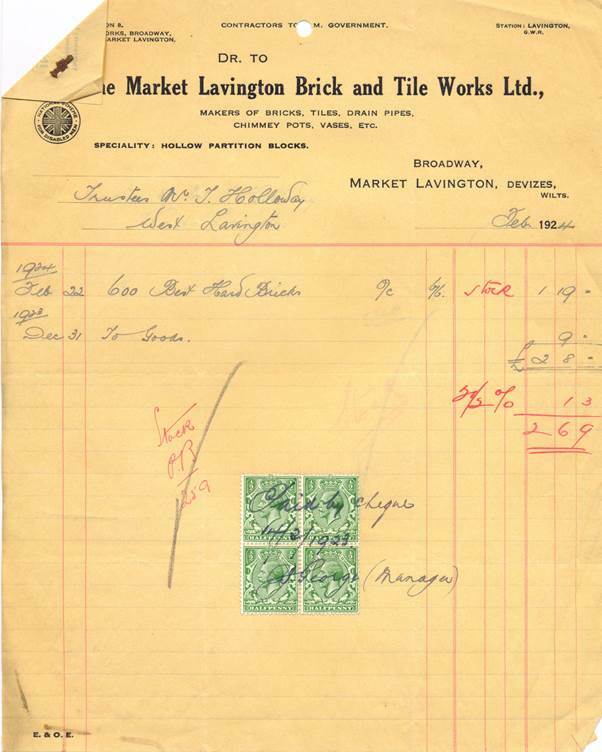 Interesting to see that 90 years ago 600 best hard bricks cost £1-19-0 (that’s £1.95 in present money). For the same amount today you might, at best, get about 4 bricks. The billhead is interesting, partly for what is not shown. It’s 1924, a big company, but no telephone number seems to be available. Huge reliance was placed on a next day postal service. But it is also interesting to note that hollow partition blocks were a speciality. These were blocks or bricks with a hole right through them. They have been plain versions of the plinth brick we showed earlier this month. Most interesting, though, is the roundel at top left. 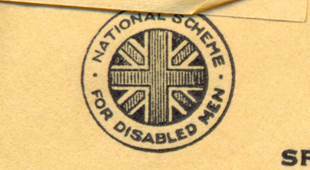 We were only 6 years after the end of World War One and there were many disabled men in the country following that conflict. It seems that Holloway Brothers did their bit to help such men – or at least they were part of a scheme to do so. This scheme was announced, by the King, in 1919 and actually, the roundel is topped off with a crown. This is hidden under the stapled fold on our document. This entry was posted on November 20, 2014 at 5:31 am and is filed under Museum. You can follow any responses to this entry through the RSS 2.0 feed. You can leave a response, or trackback from your own site.